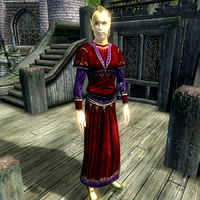 Varulae is an Altmer mage and the owner of The Serpent's Wake in Anvil. She hired a crew to retrieve a family heirloom from Summerset Isle, but they were all killed on the journey, and their spirits now haunt the ship. If you complete The Ghost Ship of Anvil quest by returning the heirloom to her, Varulae will reward you with Redwave, an enchanted cutlass. Varulae wears a set of upper class clothing: a red velvet blouse, red velvet garment and green velvet shoes. She is armed with an silver dagger and a large amount of gold. After the related quest, she will carry around her crystal ball at all times. Varulae also knows leveled sets of mage and enchanter spells. Varulae stands onboard ship night and day, hoping for someone to come to her aid; immediately upon completion of the quest, she walks to the Count's Arms. Thereafter she walks around on the ground floor of that establishment. She socializes with the tavernkeeper Wilbur and visitors, but neither sleeps nor eats. Apparently, Varulae has asked around Anvil for help but has been rejected over and over; when you approach her she will say: "This is a travesty. A complete and utter travesty. The crystal ball is just sitting there in the hold, but I'll be damned if I'm going back onboard. And nobody will help me. Nobody! Not with those spirits roaming the decks. I don't suppose you'll help me? No, of course you won't..." If you to refuse to help her as well, she will angrily say: "Of course you can't! Nobody ever wants to help! That's what's wrong with the world these days. Everybody's so damned selfish!" and finish the conversation. If you accept to help her she will be quite surprised: "Of course you can't! Nobody ever wants to help! That's the... Wait... Did you actually say you'd help me? Oh, how wonderful! I can't thank you enough! I've been going out of my mind ever since my crew was murdered! This is my ship, you see. The Serpent's Wake. I hired the crew to sail to Summerset Isle to retrieve a family heirloom, my mother's crystal ball. They made the journey, and arrived back all right, but then... Someone murdered them! All of them! Now their spirits are haunting the ship! The crystal ball is in a chest in the ship's hold, but I can't get to it. I made it as far as the captain's cabin, but the spirits nearly killed me! Get the crystal ball and return it to me here, and I'll make it worth your trouble. Here, you'll need this key. Thank you so much!" When you return with the Crystal Ball, she will be overwhelmed with joy: "You did it! You actually made it back with the crystal ball! Oh thank you! Here, please take this as a reward! It's the captain's enchanted cutlass. I managed to grab it when I was in his cabin, before his spirit chased me out! Oh, thank you so very much!" Varulae does not become an essential NPC until after she gives you the related quest. Before then, it is possible for her to be killed, which will result in being unable to start the quest. When the quest is complete, she loses her essential status. Esta página foi modificada pela última vez à(s) 20h02min de 14 de janeiro de 2013.